What contact information do I need to provide to place an order? How much medication can I purchase with one order? Do I need to fill out all the forms every time I place an order? Are generic drugs safe to consume? How can I get the less expensive generic drugs? Why am I unable to find the drug I’m looking for? Do you only sell Canadian drugs or do you sell from other countries as well? Are your prices in Canadian or US dollars? Why doesn’t Quality Prescription Drugs sell controlled and narcotic drugs? Why am I providing so much personal health information? What is the return policy on prescription drugs? We will need a valid phone number, as we must establish verbal confirmation of the order before it is processed. The most convenient way to confirm an order is to call our toll-free number, 1.877.244.0429, after submitting the order (give us an hour or two to process it first). A home address is also required for shipping. A valid prescription is required from a licensed physician who is able to practice and prescribe medicine in Canada or the United States. Your prescription must be faxed or mailed to us to complete your order. The pharmacy can only supply as much medication as your physician prescribes for you, according to the directions, and up to maximum of a three months at a time. When your doctor is filling your prescription, ask for a 3 month prescription with 3 refills, which would be valid for a year’s worth of medication. The accepted forms of payment include Personal Checks, International Money Orders and Certified Checks. We will also accept E-checks and American Express. No, after your first order, all you have to do is give us a call at 1.877.244.0429 to place a refill order. A generic drug is bioequivalent to brand name drugs (it contains the identical chemical ingredients that makes the drugs effective). Generic drugs are equivalent in strength and dosage to the original brand-name product. However, generic drugs may differ in color, flavor, or binding. By choosing a generic medication, you can save a significant amount of money. Note: It is recommended to use one formulation of a brand or generic drug consistently to achieve the best results. This is particularly true for cardiovascular drugs, antimicrobials, proton-pump inhibitors, levothyroxine (ie. Synthroid), & antiepileptic drugs (ie. Topamax, Lamictal). Yes. Both brand-name and generic drug manufacturers meet the same standards of good manufacturing practices. An estimated 50% of generic drug production comes from brand-name companies. These companies often make generic equivalents of their own or other brand-name prescription drugs once the original patent has expired. Talk to your doctor and ask for prescriptions for generic drugs whenever possible. Less expensive generic drugs can be found through our Canadian drug store database. It is illegal to ship narcotics and controlled substances by mail in the United States, so certain drugs will not appear in your searches. There are also some generic medications that are not listed because they have been generic for a long time and are relatively inexpensive in the United States. We only list generic drugs that would result in significant savings for our consumers. If the reactions are severe, please contact your local emergency service provider. Our Pharmacy Helpline would be happy to assist you with any medication-related issues at our toll-free number 1-855-218-5085. Your orders have an average delivery time of between 2 to 4 weeks. However, there are several factors that may delay the arrival of your medication. 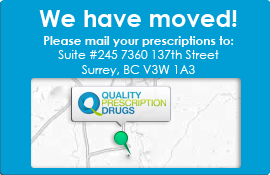 Quality Prescription Drugs currently ships to Canada, the United States, and Puerto Rico. In addition to our contracted Canadian dispensing pharmacy, we also dispense your medications from international pharmacies and dispensing facilities that meet our standards. We only affiliate with pharmacies and dispensing facilities that are handpicked and visited by our licensed physician. We are also certified on an annual basis by independent, third-party companies, CIPA and Pharmacychecker.com. We ship products to our customers from Canada, Mauritius, Singapore, Turkey, United States, India, New Zealand and the United Kingdom. We can be contacted from Monday – Friday between 6:00am – 8:00pm PST and Saturday – Sunday 7:00am – 5:00pm PST. All our prices are stated in American Dollars. There is also a $9.00 US shipping fee per patient. All quoted prescription drug prices include the prescribing fee and pharmacy dispensing fee. Maple Leaf Meds will not handle controlled and narcotic drugs because it is illegal in the United States to sell narcotic or controlled substances through mail order. If an online pharmacy promises narcotic or controlled substances, they are most likely fraudulent. In the interest of your safety, we will use your health information to understand your individual medical situation. Similar to your local pharmacy, our licensed pharmacists and physicians will use the information to assess your prescription and potential drug interactions. If the reactions are severe, please contact your local emergency service provider. Our Pharmacy Helpline can assist you with any other medication-related issues at our toll-free number 1.877.244.0429. Pharmaceutical laws are strict on dispensed products. We are bound by the same restrictions as your local pharmacy, which dictates that dispensed products cannot be returned. The majority of patients save 20-60% on their prescription drugs and the savings can go as high as 80% on certain drugs.